The landscape between the Kissimmee River and the St. Johns River is home to a vast array of wildlife, particularly birds. Here are huge dry palmetto prairies interrupted by floodplain marshes and wet prairies. Sandhill crane, wood stork, burrowing owl and crested caracara are found in abundance in the prairies and pastureland of Florida’s ranchlands. In Okeechobee County, some 53,000 acres of this habitat is protected by Kissimmee Prairie Preserve State Park (KPPSP), which borders the river to the east. The park is familiar to conservationists as one of the last strongholds of the Florida grasshopper sparrow, which is now considered the rarest bird in North America, due to a recent population decline. To the east, across ten miles of pasture, flatwoods and marsh, lies the Fort Drum Marsh, the southernmost point of the St. Johns River headwaters. This portion of the river is known as the Upper Basin (the river flows north, emptying into the Atlantic near Jacksonville). The entire length of the St. Johns Upper basin is buffered by conservation property, thanks to the forward-thinking of water management districts and conservationists, who recognized that development along the Atlantic coast would impact downstream water quality and fragment the flyway for migratory waterfowl. Fort Drum Marsh is protected as a SJRWMD conservation area, and is bordered to the north by Blue Cypress Conservation Area, which is in turn bordered by Three Forks Conservation Area, and so on, all the way to the outskirts of Orlando. The lands around the St. Johns constitute an ideal wildlife corridor. The corridor could potentially reach from Ocala National Forest to Osceola County and the Kissimmee River. But in order for this vision to become reality a few key pieces must be added on the Kissimmee end. The ten miles between the two conservation areas stand to be protected by the Kissimmee-St. Johns Connector Florida Forever BOT project. The 36,177-acre project consists of a landscape mosaic primarily of improved pasture, mesic flatwoods, and wet prairie. The wet and dry prairies of the western portion of the project are contiguous with KPPSP. Toward the eastern half of the project there are bottomland hardwood forests buffering blackwater streams, which feed into Fort Drum Marsh. This habitat diversity equates to a great diversity of species distributed across the project. Acquisition and management of the Kissimmee-St. Johns Connector is important for the long-term welfare of the species mentioned previously. Strategic Habitat Conservation Areas (SCHAs) for these species comprise a large portion of the project. 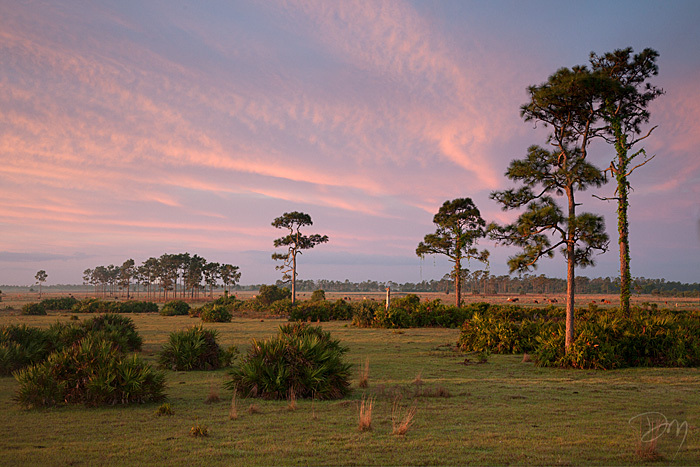 Acquisition of the property meets Florida Forever goals of increasing protection of Florida’s biodiversity, protecting and restoring the natural functions of land, and increasing natural resource-based public recreation. The project may also help complete the Florida National Scenic Trail, a statewide non-motorized trail that crosses a number of Florida Forever project sites. The resource diversity of the Kissimmee-St. Johns Connector qualify it for a wildlife management area designation. This would mean public accessibility to a large tract, with expanded opportunities for hunting and fishing, hiking, camping, horseback riding and wildlife viewing. The primary purpose of the project is the protection of the hydrological connection between the two watersheds. This frequently inundated landscape contributes to the filtering of excess nutrients from water for both the Everglades and the St. Johns watershed. The two watersheds supply drinking water for over 10 million Floridians living along the Atlantic Coast, and throughout central and south Florida. The ecological relevance of the landscape that feeds these two rivers simply cannot be overstated.